SCHIPHOL AIRPORT 28 March 2018 – End 2016 WDP entered into a lease agreement with FIEGE for 27,000 sq. m. for her distribution center at “Het Klooster” Inundatiedok 34 Nieuwegein. 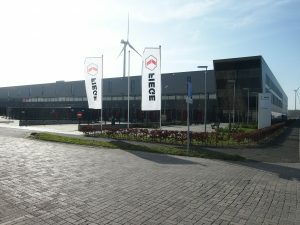 Because a lack of space FIEGE recently expanded in the building up to 35,000 sq. m. From out this center FIEGE services a variety of clients among whom MediaMarkt and Bol.com. Because of increasing growth in the E-commerce sector, FIEGE decided in consultation with WDP to expand the leased space and to extent the existing lease agreement. Except for 2 floors of office space FIEGE now leases the whole building, which is more than 35,000 sq. m.
FIEGE is a European logistics company specialised in efficient supply chain solutions. With more than 12,000 employees at 178 locations in 15 countries and with clients in primary Europe, India and China FIEGE operates on an international level. In this transaction WDP was advised by INDUSTRIAL real estate partners.